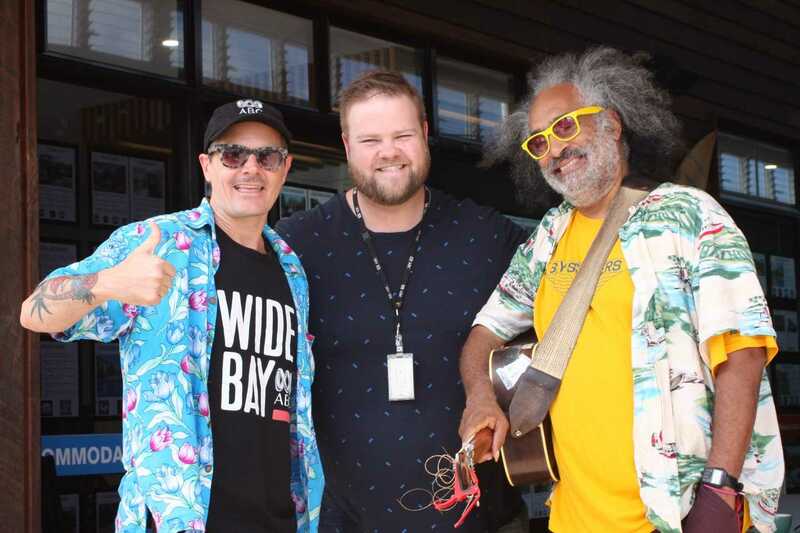 Home » News » Beach Boys from ABC Radio Wide Bay pay a visit! Beach Boys from ABC Radio Wide Bay pay a visit! ABC Radio Wide Bay covers Gympie, Maryborough and Bundaberg and presenters Brad Marsellos and Ross Kay are keen visit the Cooloola Coast more often! They were here recording the Festival of Small Halls, and followed up with a live breakfast broadcast from our Main Street. Coffee Rocks supplied a great venue – with lots of comments from local foot traffic. We made sure the message got across that despite weather forecasts, we’ve had beautiful days for our start of summer, and that our lack of traffic, and laidback life here, make for a perfect holiday! If you have an event or issue you’d like on local radio – let us know. We hope to see Brad and Ross back soon.